The School of Early Aesthetic Development Unikum of the Center for Continuing Art Education of the Faculty of Arts and Design of Altai State University forms day-care groups with mixed age. Another direction of the Unikum activity is designed for children of primary and secondary school age who will be able to learn vocal, the basics of a foreign language, painting, choreography and a number of other disciplines outside of school. “Initially, our project meant working with children – children of preschool age and in the future – with adults. But when we announced the admission to our school, we voiced the training program, and parents of school-age children showed interest in our work. 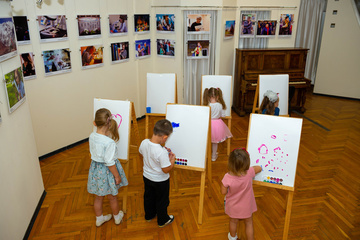 Therefore, we decided to form after-school groups, in which the program included, in addition to basic and supplementary classes, time for school tasks and meals at an affordable price,” said Ksenia Alexandrovna Melekhova, director of the Center for Continuing Art Education at the Faculty of Arts and Design of ASU. Training in extended-day groups will consist of an educational complex, which includes five obligatory disciplines: choreography, vocal, solfeggio (rhythmics), painting, and a foreign language (English, Chinese). Additional lessons are also planned on acting, playing musical instruments, etc. It is to be recalles that the Unikum school project, developed as part of ASU strategic development program, is aimed at the aesthetic development of children of preschool and school ages. Unikum is a universal program for the development of the child’s personality and an individual approach to the teaching of designated disciplines, and most importantly, a complex of creative areas through which children can most fully develop their abilities. The curator of the school is the doctoral student of the Rostov Conservatory, the candidate of art Olesya Sergeevna Mikhaylova.